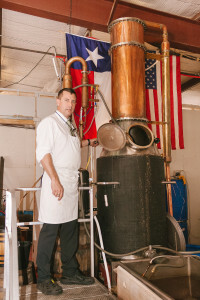 Four months after his retirement from the Marine Corps, dressed in slacks, a white button up, a green tie and a white apron with an orange smear across it, 41-year-old Quentin Witherspoon stands before a group of people who came to tour his recently opened Lewisville distillery. 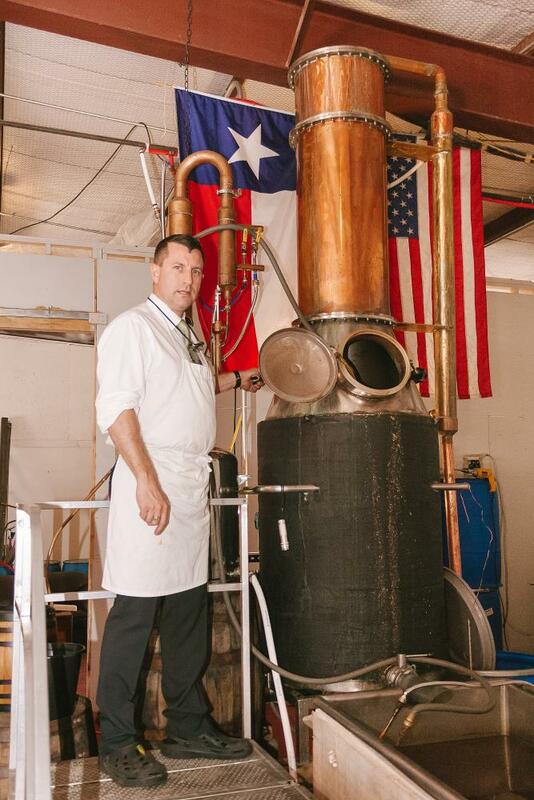 Witherspoon Distillery at 545 N. Cowan Ave. Suite F brings industry to Lewisville as well as autonomy to a once government-controlled man. The distillery is the closest one to campus, at 16 miles away. He began distilling, or purifying, liquor as a young Marine in Africa. Witherspoon’s River Rum won a silver medal in the white rum category of the Los Angeles International Wine & Spirits Competition in 2012, before the distillery was opened for business. The award-winning rum and Witherspoon’s bourbon can be bought at various Goody Goody locations, Spec’s, Paradise and Fossil Creek Liquors. In Denton, the bourbon is available at East Side Social Club. The free distillery tour begins in a close-quarters waiting room where IDs are checked. Witherspoon tells guests his distilling history and identifies what makes liquors different before he takes everyone into the distillery. “I am going to walk you through production all the way to the point where you can put spirits in your mouth,” he said. The balmy distillery contains two stills that were made by a neighboring business. Witherspoon thoroughly explains the distilling process and stops to answer any of the tourists’ questions. Gill Whitlow, who was on one of the tours, said Witherspoon obviously loves what he does and takes great pride in his work. Whitlow and her husband Andy came to the distillery tour because they had been following the facility on Facebook. 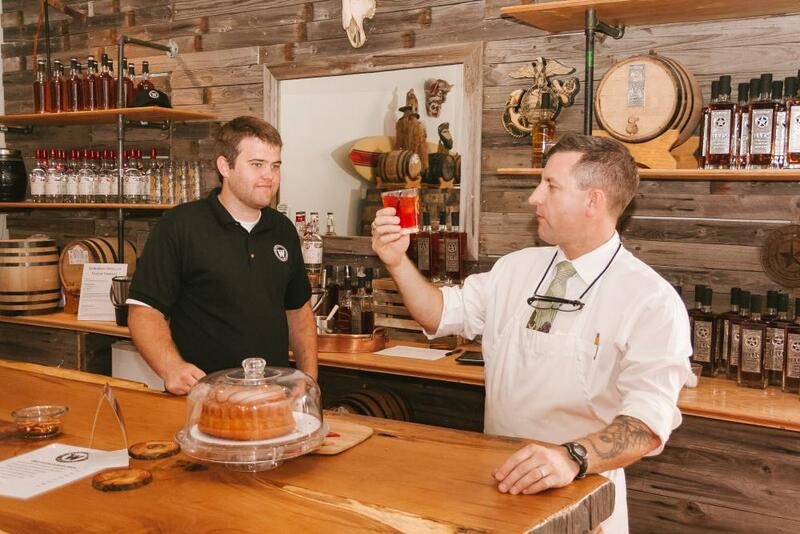 The Witherspoon Distillery page has 709 likes. “We’ve been living in Lewisville 15 years and we do very little, so we thought we’d do something different,” Andy Whitlow said. The couple said they would definitely return to the distillery. They want to bring friends and relatives who visit to the tour. The tours attract at least a couple dozen people every Saturday, and at least 75 percent of the crowd buys a bottle of liquor after the tour and tasting, Witherspoon said. The Whitlows also plan to attend the social events the distillery holds, such as ice cream socials held on Thursdays from 4 to 7 p.m. The ice cream is made at the facility and the event is open to all age groups. Quentin’s brother Bert does not work for the distillery but often represents the company at tasting events. Secretary Kristin La Mere said the product that comes out of the distillery surprises her every day. The distillery makes whiskeys and rum and sometimes – around the holidays – small batches of brandy, she said. Seven years ago, Witherspoon began formulating a way to escape working for the government and do something fulfilling, he said. Family friend Daryl Paulson said although he was aware that Witherspoon knew how to make rum, he didn’t foresee a distillery coming out of it. Whitlow also said this distillery is important to North Texas. 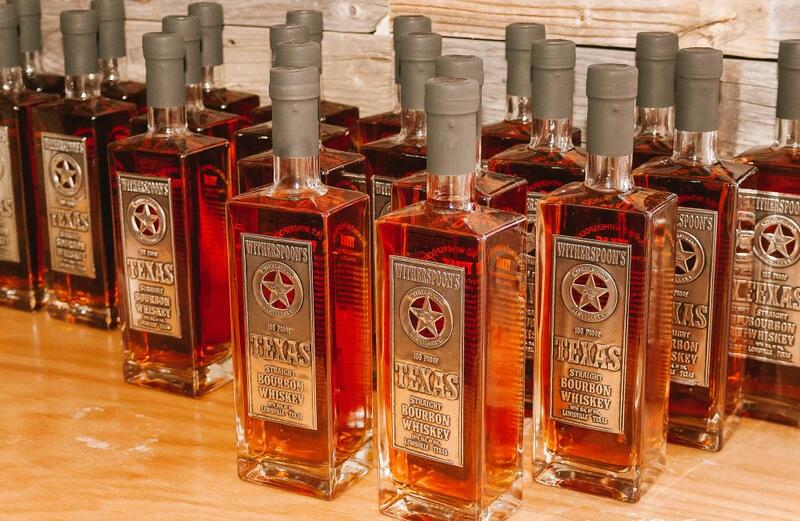 These distilled spirits can also be bought on-site thanks to Texas bill S.B. 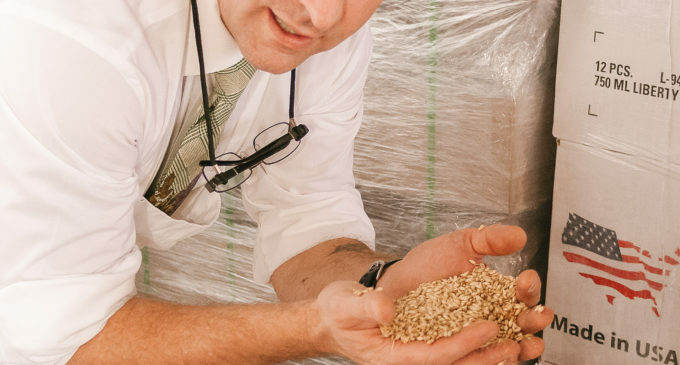 905, which allows distillers to sell their goods straight from the production site. Now Witherspoon is hoping the referendum to make Lewisville a wet city, one that allows liquor to be sold within city limits, will pass in November, he said. Witherspoon said his biggest obstacle with the business has been handling the explosive growth of the company. Witherspoon’s grandfather David Witherspoon impacted the distillery owner’s views of business. His grandfather succeeded in business without real education, but with the knowledge that people mattered most and action was the only way to get results, Witherspoon said. Tours are held four times a day every Saturday. Those of age can reserve a tour spot by calling (214) 814-0545 or emailing info@witherspoondistillery.com. Tourists can buy rum cake and drink ware as well as bourbon and rum on the premises.